Everything we read about Seven Points CoE campground on J. Percy Priest Reservoir at Hermitage, TN was positive, so we looked forward to this stay on the east side of Nashville. The campground lived up to its billing. The campground is in a beautiful wooded area along the big lake. The campsites are long and deep with large patio areas. If you want to stay more than a chance night or two (and even that won’t be possible on weekends) you’ll need to make reservations well in advance as this campground is very popular and it fills up night after night. Our stay was for a week and the “no vacancy” sign was up for our entire stay. Seven Points is close to I40 but it feels farther than it is because you have to make several turns through residential streets to get to it. The roads are plenty wide enough for any RV, though, and not really a problem. Follow the directions on the campground website and you’ll be fine. While all the sites are very nice the lakeside ones are something special. All of them feature long driveways off the road and great lakeside camping in the trees. 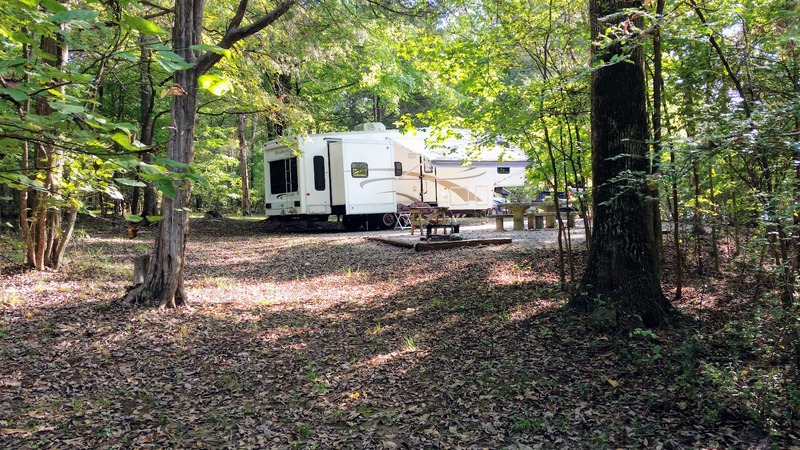 The rest of the sites are nicely wooded and if not for comparing them to the premium lakeside spots they would be considered prime real estate in most campgrounds. So, right off, you want a lakeside spot if you can get it (I reserved four months out and they were all taken). If you can’t get a lakeside site, there are a few on the inside loop that afford nice lake views. They are, I think, sites 26-30 and 38-44. There are no sites with sewer, but all do have 50 amp electric and water. There is only one shower house and it is a bit of a walk from both the north and south opposite ends of the campground. I found it strange that there’s a nice gravel trail from the back of the shower house, through the woods to the opposite side of the campground. However, once you get there you find yourself in the back of someone’s campsite with no further trail. It seems like a lot of effort to service just two or three campsites. The dump station was designed by someone who obviously never drove a larger RV. The turns are sharp and the roadway is narrow. You’ll likely end up with wheels “cutting the corner” but no worries, it’s obvious that it has happened many times before. Satellite TV will be easy for people with portable domes and lakefront property. It will be considerably harder for those with rooftop units or who are camped on the inside loop. It will be impossible in several sites. I made it, but the window was very small. Our Verizon signal was decent. The campground is close to some major shopping areas, especially at nearby Mt. Juliet. Also Andrew Jackson’s Hermitage is nearby. All the Opry-related attractions are less than 30 minutes away. We most always like Corps of Engineers campgrounds and this is a great example of why. We hope to return the next time was come to the Nashville, TN area. This entry was posted in Scott and tagged Army Corps of Engineers, camping, review, Tennessee. Bookmark the permalink.